There's a new student in Calvin's class, a boy named Owen. Mrs. Gilson, their teacher, asks Cal to show Owen around. Cal is curious about Owen, because he overheard Owen's mother telling Mrs. Gilson that Owen has burgers and drum. Where could Owen be keeping his burgers and drum? Are they in his backpack? Owen tapes the classroom rules to his desk, speaks too loudly and steals the ball when the students try to play soccer at recess. Cal can't figure out if Owen wants to be friends or not and he still hasn't found Owen's burgers and drum. Cal tells his mom about Owen. She explains that Owen has something called Asperger's Syndrome, which gives him a different learning style but he still could become a good friend. 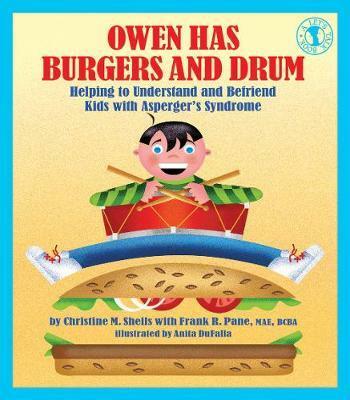 Owen Has Burgers and Drum is a fun story addressing the difficulties and rewards of befriending a child with Asperger's Syndrome. At the end of the book, the authors provide tips and suggestions to help parents and educators talk with children about Asperger's Syndrome and to help children better understand kids with an autism spectrum disorder. Christine Sheils has worked as an instructional aide for special needs children for over twelve years. She feels that mainstreaming children with special needs into inclusion classrooms benefits not only the special needs children by exposing them to appropriate peer modeling, but also the regular education students by sensitizing them to different learning styles. She holds a BA in Art History and Studio Art from Rutgers College, New Brunswick, New Jersey and attended the Art Student's League in New York, New York. She resides in Mendham, New Jersey. Frank Pane, MAE, BCBA, has over fifteen years of experience working with individuals with autism and their families. He is the co-owner of Pane Consulting, LLC, which provides consultation to schools and home applied behavior analysis programs. He earned a master of arts in education from Seton Hall University, New Jersey and a bachelor of science in psychology from Saint Joseph's University, Philadelphia. He holds both general education and special education teaching certificates and lives with his family in New Jersey.